As time and conditions allow, certain non-native plants will take over wetland and forest landscapes, wiping out native wildflowers and shrubs and with them the complex community of life dependent on those native plants. With funding assistance from Friends of Acadia, Acadia National Park is in an intensive, multi-year campaign to control invasives before they become unmanageable. More than a quarter of the plants growing in Acadia National Park now are not native. 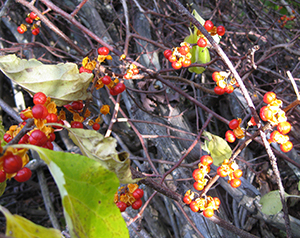 But, when a plant has disrupted an area’s natural ecological relationships and processes, it is said to be “invasive.” Even without completely dominating a landscape, invasives can crowd out many natives including rare plants. Invasives can distract pollinators from native plants, provide wildlife with fruit and foliage less nutritious than that of native plants, and even create physical barriers to wildlife moving freely through an area, detecting or evading predators, and finding shelter. As time and conditions allow, certain non-native plants will take over landscapes, wiping out native wildflowers and shrubs and with them the complex community of life dependent on those native plants. Grants from Friends of Acadia have hired a project manager and partially funded the program since 2008. Acadia’s exotic plant management team dramatically grew in size and experience in 2013 thanks to a generous grant from Canon U.S.A. The team manages the top 25 highest priority exotic invasive plants species to protect native plants and their habitats and allow visitors to experience the park’s landscapes unaffected by exotic invasive plants. Complete eradication of invasive plants in Acadia is not considered a realistic goal. Fortunately, consistent, dedicated, and intensive management can keep invasive plants from having any significant negative impact on the ecosystem. At home, garden with native species and avoid purchasing plants known to be invasive, such as purple loosestrife, Japanese or common barberry, Oriental bittersweet, or multi-flora rose. Check your property and remove plants you know to be invasive. You can also volunteer to help remove invasive plants from Acadia.